I would recommend to a friend. I love this sink. The only thing is it is not as dark as I thought it would be. But it will be just fine. I can't wait to see it all together in my new house. Upgrade your bathroom decor with this stunning deep pan vessel sink from Premier Copper Products. 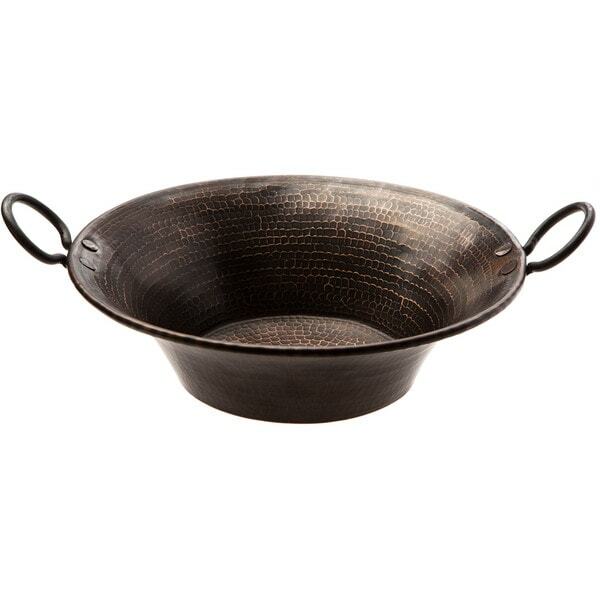 Hammered from copper, this round vessel sink is sure to please. Does not include drain, must purchase separately. This vessel sink is absolutely stunning. I've received may wonderful comments on it. You do need to use a special caulk if you plan on caulking around the base. It did not sit completely flat so I did not want water seeping under it . And it is copper so you have to be careful it will tarnish if it gets caustic materials in the sink (I had a tiny incident with glue), however soaps and toothpaste do not effect the finish. Well worth the extra effort!! I had this vessel sink in my last home and absolutely love the look and the easy care of this product. Delighted I found the same sink and could ordered it again. So many great compliments with this in combination with the water pump faucet. Just as pictured...my only feedback would be that they should include the drain! Highly recommend this sink! Looks perfect in a rustic bathroom! I loved this sink. It was made really nice. However I regretted that I had to return it because I decided I did not want to match this with brushed nickel that was in the rest of my bathroom. It looked so cool with the bronze pump faucet. A great look for a country bathroom. I still think about this sink. I have an antique wooden washing tub which I am converting to a bathroom vanity. This was the perfect vessel sink to mount on top of the tub enhancing the rustic appearance. It will definitely be a conversation piece. This sink is just what the picture shows. Goes great in our rustic bathroom. Great sink for the price. Sink was delivered quickly and was packaged well for shipping. Beautiful copper looks almost like snack skin pattern. I bought two of these sinks and they are beautiful!! It was exactly as described. I haven't installed them yet, but am please with the quality so far. bought this vessel sink for home I built 6 years ago, loved it and had many compliments on the sink and a pump faucet. Great price and liked the hammered metal look.